Another on the reading list post, I'm still hauling books from Christmas! I still haven't hit the charity shops looking for more yet, I'm sure the time will come soon! "It's 1999 and for the staff of one newspaper office, the internet is still a novelty. By day, two young women, Beth and Jennifer, spend their hours emailing each other, discussing in hilarious detail every aspect of their lives, from love troubles to family dramas. And by night, Lincoln, a shy, lonely IT guy spends his hours reading every exchange." "One snowy night in Toronto famous actor Arthur Leander dies on stage whilst performing the role of a lifetime. That same evening a deadly virus touches down in North America. The world will never be the same again. Twenty years later Kirsten, an actress in the Travelling Symphony, performs Shakespeare in the settlements that have grown up since the collapse. But then her newly hopeful world is threatened." "I’m stranded on Mars. I have no way to communicate with Earth. I’m in a Habitat designed to last 31 days. If the Oxygenator breaks down, I’ll suffocate. If the Water Reclaimer breaks down, I’ll die of thirst. If the Hab breaches, I’ll just kind of explode. If none of those things happen, I’ll eventually run out of food and starve to death. So yeah. I’m screwed." "When it comes to relationships, Colin Singleton's type is girls named Katherine. And when it comes to girls named Katherine, Colin is always getting dumped. Nineteen times, to be exact. On a road trip miles from home, this anagram-happy, washed-up child prodigy has ten thousand dollars in his pocket, a bloodthirsty feral hog on his trail, and an overweight Judge Judy - loving best friend riding shotgun - but no Katherines. Colin is on a mission to prove The Theorem of Underlying Katherine Predictability, which he hopes will predict the future of any relationship, avenge Dumpees everywhere, and finally win him the girl." 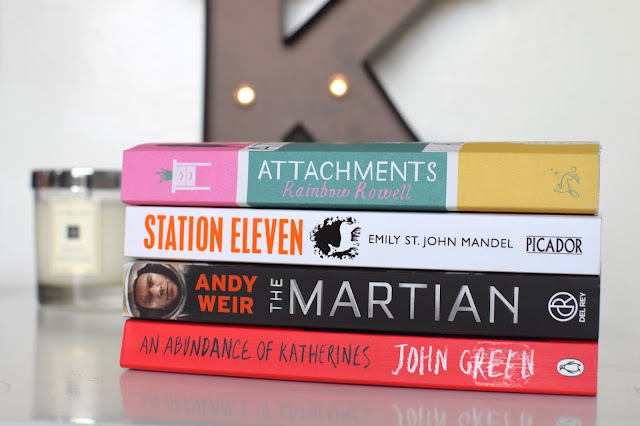 These all sound like great reads, especially the John Green. Think I will need to add these to my reading list. I just read Station Eleven and really enjoyed it - it totally surprised me. I hope you enjoy it. The Martian was great too, did you see the movie?